The love of your life, a romantic atmosphere under palm trees and a glass of sparkling wine make your marriage proposal perfect. We on board the Victory provide a very special ambience if you ask the most important question of your life. Book our romantic package for your stay at the Hotel Victory and enjoy romantic moments for two. With rose blossom decoration and a bottle of Prosecco as well as a small selection of sweets we make this emotional moment an unforgettable experience. For 2 persons at 57,00 Euro depending on availability. Extend the most beautiful day of your life and enjoy a romantic time out as a newly married couple after your dream wedding. At your private retreat high up on the sun deck of the VitalOase you can leave the exciting wedding hustle and bustle behind you and dream of your future together on our cosy SunLoungers. Let your gaze wander over the exotic thermal landscape and experience unforgettable moments for two in the evening hours with atmospheric lighting. Book your private SunLounger (for 2 persons) on the sun deck of the VitalOase for only 30,00 € per day. Best man, bridesmaids or best friends are the greatest support during your wedding and have been busy planning and celebrating. There is no better way to say thank you than spending a wellness day together. Book your private SunLounger (for 2 persons each) on the sun deck of the VitalOase for only 30,00 € per lounger and day. Would you like to use the sun deck exclusively for yourself and your loved ones? This is also possible and will be the highlight of your wedding celebrations. Are you looking for a very special wedding gift? With a romantic break under palm trees you will give your loved ones something priceless - unforgettable moments for two. Say YES to a voucher as a wedding gift! 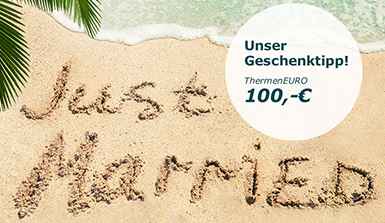 With 100 ThermenEuro the newly married couple can arrange their relaxing wellness day according to their own ideas and comfortably pay the admission price as well as all wellness offers with this voucher.